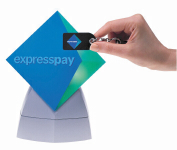 Six years after it began testing a payment device that attaches to a key chain, American Express is discontinuing its “Express Pay” fob that was created for convenience. The fob is one of many new payment methods introduced by the credit card industry in recent years. According to the Wall Street Journal, credit card companies are so eager to persuade consumers to ditch their cash and checks, they are trying to turn key chains, wristwatches, and everything else into payment devices. It appears consumers may not be wowed by the devices as much as the card companies had hoped, but are still happy with traditional contactless payment cards. “We have actually found that our customers prefer to use the contactless technology through our traditional cards” rather than the key fob, said Richard Flynn, a senior vice president who oversees “cardless” payments at AmEx.